AHA! My new research blog taught me something. 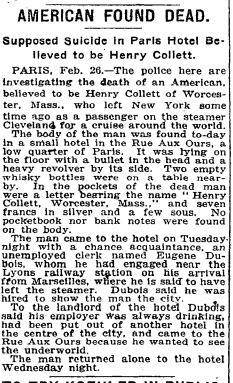 Bottom right of page: ” Mysterieux Suicide” from Paris’ “The Matin”, Feb 27, 1914. It’s probably not new information, and the quality isn’t that great. Still, fun to look at. http://gallica.bnf.fr/ark:/12148/bpt6k570810h/f3.image Trying to read with my knowledge of high school French. Good find! I had a good deal of French in college & can read most of it but am gonna take a closer look, because I just don’t know a few words. I started to transcribe, but I actually have some things to do today. 🙂 (Enjoyed the unsolved nature of this case from when you first posted it.) Will email what I have. The secrets of poor Mr. Collett go with him, then. Secretly, I was hoping for a trial.